Candidates can check all the details related to All Law Entrance Test (LET-2019) Admission like eligibility, application process and more through this page below. 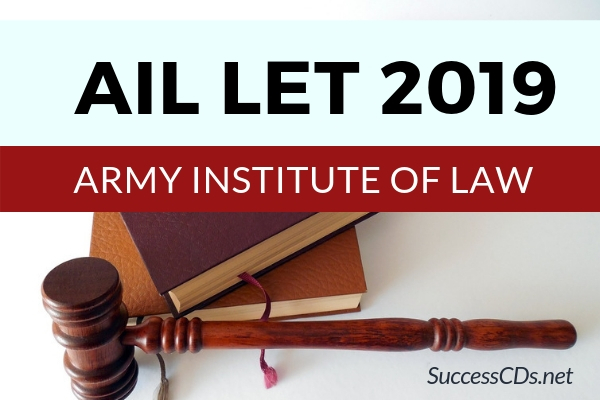 Army Institute of Law (AIL), as a centre of excellence in the field of legal education, aims to (i) Impart high quality legal education and professional training to its students (ii) Enable its students to pursue a career at the bar, Judicial Service, Civil Services, Armed Forces, Corporate Houses and such other organizations. B.A., LLB (Five-Year Course): By the time a student completes the five year integrated Program he/she will be fully equipped with the knowledge and experience in the field of law required to become a full-fledged responsible member of the legal profession. Candidate who has passed 10+2 examination from Punjab School Education Board or any other equivalent examination recognized as such by the Punjabi University, Patiala, securing at least 45% marks vide Punjabi University Letter No.216468/Meeting-4 dated 7 May 2004 (The applicants, who have obtained 10+2 through Open University systems directly, without having any basic qualifications for pursuing such studies, are not eligible for admission in Law Courses). The applicants appearing for the qualifying examination in March/April are allowed to take the Entrance Test provisionally, subject to the condition that their candidature shall stand cancelled in case they do not pass the 10+2 March/April Exams with the required percentage of marks. Candidates passing the compartment papers of qualifying exam of 10 + 2 subsequently shall not be eligible for admission even if a seat is available. In case an applicant has passed a qualifying examination from Board/University whose degree has not been notified as equivalent to the Punjabi University, Patiala, he/she will have to produce the eligibility certificate from Punjabi University, Patiala at the time of interview, failing which his / her candidature shall not be considered. Candidates whose declaration of results is delayed should apply well in time to the concerned Board of examination to forward a confidential result directly to Principal, Army Institute of Law, Mohali, Punjab. The responsibility to ensure its timely dispatch will be that of the candidate. Admission to 64 (60 seats of wards of Army Personnel). Admission to 04 seats in the All India Category will also through the same entrance test. After submitting the above-mentioned information, a Bank Pay-in-Slip will be generated; the unique AIL Registration No will also be mentioned on the Bank Pay-in-Slip. Now go to any branch of Axis Bank and deposit fees to the AIL account which is mentioned on the Bank Pay-in-Slip. After depositing your fee at the bank please check that journal number and branch code are clearly written on the bank slip. Online form step -II cannot be completed without journal number and branch code. Before applying online, Scanned copy of the Passport Size Photograph (Size Maximum 120KB), Signature (Size Maximum 100KB), 10th DMC & Bank Receipt should be ready for filling the Online Form.